My Favorite Things - Witch Way is the Candy? Good Evening Everyone and Happy Halloween! I cannot believe it is already the last day of October....I feel like this month has seriously flown by. 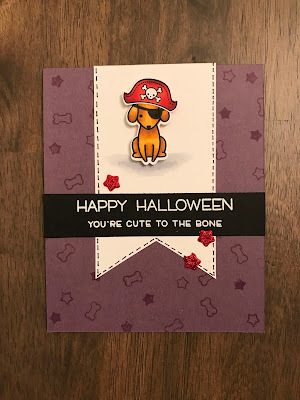 But as I promised, I have one last Halloween Themed card for you guys today. Before we get to the card, I just wanted to let you guys know that starting next month I will begin my Holiday cards mini-series and I will also be showcasing a few Thankful projects as well. So be on the lookout for those soon. Onto the final Halloween Themed card for the year. Today I am featuring one of my new favorites, MFT Witch Way is the Candy? Stamp Set. This set released quite a bit ago but MFT just re-released it this year and I was sure to snag it! Hope you guys enjoyed this mini-Halloween series! I'll be sure to be back soon! Happy Sunday Everyone. I hope that your weekend has been a good one. Today, we have carved out our pumpkin and have a kids Halloween Party to attend this afternoon for my husbands work. I love holiday festivities! Before Halloween has come and gone, I have a couple more Halloween themed cards for you guys. 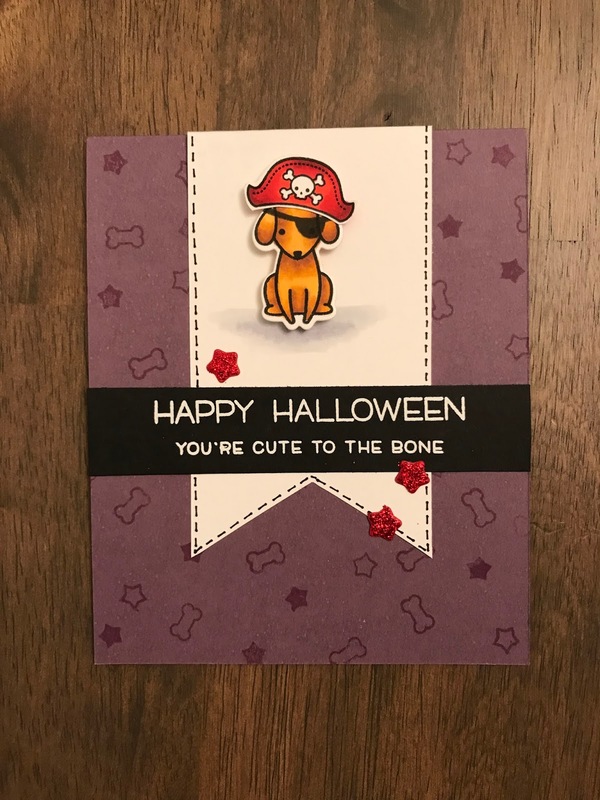 Today's card features 2 Halloween stamp sets from Lawn Fawn, Booyah and Happy Howloween! And here is a video showing how I took these 2 stamp sets to create a whole new look for this pup! Hope you guys enjoyed this video and I'll be back with 1 more in time for Halloween. Hey Everyone! I hope your week is going good. Its very gloomy, windy, and raining here in Jersey....perfect day for Crafting! 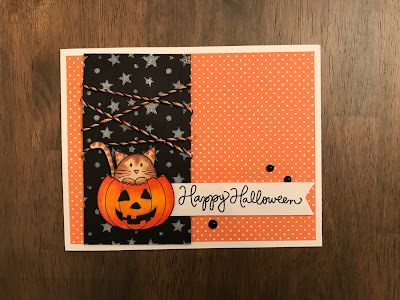 Today I have another Halloween card for you guys using another Simons Says Stamp stamp set, Hey Pumpkin. This one is an older one but it is seriously adorable. And I'm pairing it with a stencil, also from Simon Says Stamp, called Stars & Dots. 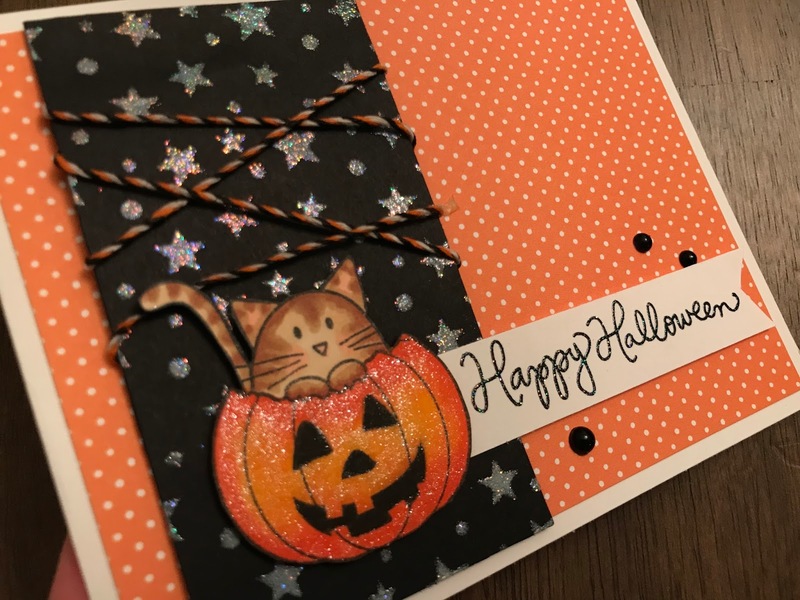 And this card was super quick and easy to create, which is always plus. I absolutely LOVE all of the sparkle on this card, and this picture above really shows it all. Here's a video showing how I created this super quick and simple card! Hope you guys enjoyed and I'll be back soon with yet another Halloween card. Trying to squeeze them all in within the next week! Hey Everyone! I hope your off to a great week. I cannot believe we are only 2 weeks away from Halloween!! I feel like the month of October has literally just flown by. So the next few projects that I will be posting will be Halloween Themed. Today I have a OHWC (One Hit Wonder Card), which is a card that I've created using only 1 stamp set. I'm not using any other stamp sets or embellishments on my card, only one single stamp set. I like to do this occasionally to really challenge myself into getting the most out of a single stamp set. The stamp set that I'm using today is Trick or Treat Pets from Simon Says Stamp. I simply adore this stamp set and am happy to finally getting around to using it. Hope you guys enjoyed and I'll be back very soon with another Halloween card!